BONO HAS PROMISED to “wave a big, bright, blue EU flag” on stage when U2 kicks off their European tour in Berlin this week. The Irish frontman made the pledge in an article in the Frankfurter Allgemeine newspaper as he argues for the future of the European project and warned about the rise of “extremist politics”. He also felt proud about how European countries have “rallied behind Ireland” in Brexit negotiations. Bono wrote that “Europe is a hard sell in Europe these days” and that “Europe is a thought that needs to become a feeling”. 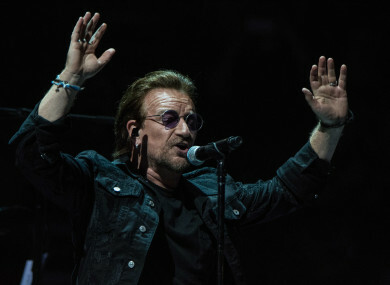 “I’m guessing that even to a rock audience, waving an EU flag these days is either an annoyance, a bore, a kitsch reference to the Eurovision Song Contest but to some of us it has become a radical act,” Bono writes. Europe, which for a long time triggered a yawn, today sparks a kitchen-table screaming match. Europe is the theatre of powerful, emotional, clashing forces that will shape our future. In the course of the article, Bono quotes John Hume and Winston Churchill and says that he loves Europe’s differences, “our dialects, our traditions, our peculiarities”, he writes. “The word patriotism has been stolen from us by nationalists and extremists who demand uniformity. But real patriots seek unity above homogeneity. Reaffirming that is, to me, is the real European project,” Bono says. We’re seeing a spectacular loss of faith in that idea. Fuelled by the unevenness of globalisation, and a failure to manage the migration crisis, nationalists say diversity is a danger. Seek refuge, they tell us, in sameness; drive out the different. Their vision for the future looks to me a lot like the past: identity politics, grievance, violence. Bono also expresses his pride that other European countries have “rallied behind Ireland on the border issue” as part of the Brexit negotiations. The article in one of Germany’s largest broadsheet newspapers comes as Minister for Foreign Affairs Simon Coveney visits the German capital today. Email “Bono says he's proud of how European countries 'rallied behind Ireland on the border issue'”. Feedback on “Bono says he's proud of how European countries 'rallied behind Ireland on the border issue'”.